This is a great extension! As you mentioned it doesn't work when app is closed on Android. Do I have your permission to modify the code a bit and try to see if I can let it work with my server?! Thanks a lot for your work! Appreciated! Yes you have, if you have a solution, let me know. In NCReceiver you try to access Extension.mainActivity .. it is null! So we create a new Intent. For the iOS I needed to change something as well to make it work on < iOS 8 … Everything works nicely on iOS 8.1.2 but failed on my older devices. So now I can try to connect to my server and display messages that I need to say to the user. On Android/Java I think I can manage to not raise the notification but keep it repeating. Do you have a trick I could use to do the same in iOS? 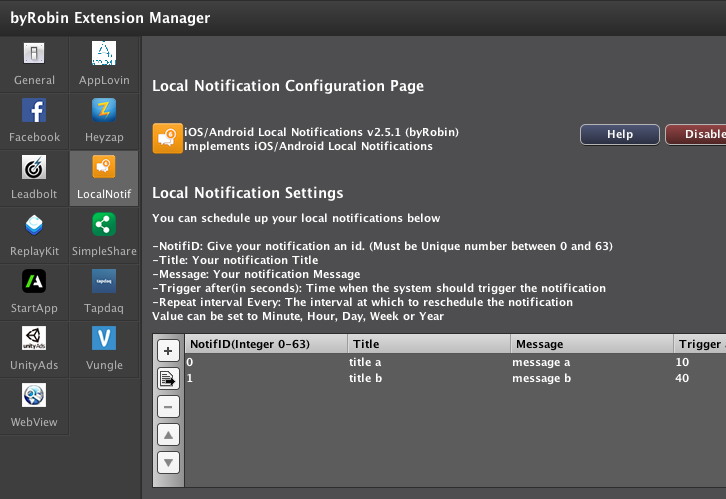 the result raise the actual notification or omit the notification and check the server in the repeated - setting. Thanks a lot for your solutions, i have updated the extension. No, sorry don't know a trick for that. The AndroidManifest.xml contains SMS permission. Why did you turn that on? I've removed the permission and the app seems to work fine without it. I played a little with private subclassing your NCReceiver to make the notification fire when a reponse is received from an online server. That appears to work in my test situation for Android. I'm about to test/play with iOS to do the same. Do you mind if I made a new extension based of your work? I want to notify gamers with invites from other players to join a game or send gamers other information from my server! I tested notification with SMS, forgot to delete it. Do you mean like Push notification extension? Than you can make a Push notification extension based of my work. But make it for Android and IOS. I have a lot of work at it. If this extension works good, maybe we wanna build it in Stencyl. Remote / Push notification was not exactly what I was going for. From what I've seen the mechanism would involve a lot of tweaks to get right. What I've discovered so far is that iOS doesn't really allow background applications to become active easily. There are some things that I'm exploring but it isn't as easy as Android was. What Apple seems to want you to do is to go for remote notification. Wat bedoel je precies? Heb je er al veel tijd ingestoken of was je van plan er tijd in te stoppen? Ik bedoel dat ik er veel tijd in de extension heb gestoken, en daarom dat je op basis van mijn werk een nieuwe extension mag maken. iOS have lots of roles, i think what you wanna do, only possible with Push Notificaton or Game Center Multiplayer methode. But i am not sure. [openfl] Error: Could not find asset path /STENCYL_DEVELOPMENT/stencylworks/engine-extensions/localnotifications/assets/"